For more than 15 years, the Sister Scholars, our collective of seven TESOL women scholars, working in Hong Kong, the United States, and Canada, have been embracing sisterhood and finding collegiality and inspiration from each other as we write; present conference papers; meet; email; and exchange information, advice, encouragement, and support. 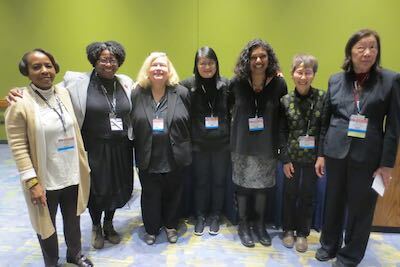 At the TESOL 2018 Convention in Chicago, we presented a colloquium on “Speaking Up and Pushing Back: Women of Color in the Academy,” actions that we have found to be challenging yet essential in the academy, and that have been more possible in the context of sisterhood. In this article, we share a short version of that colloquium. We theorize the institutional contexts in which women of color working in the TESOL academy operate, drawing on womanist, feminist, postcultural, and critical race theories, as well as historical feminist, labor, and civil rights movements, in order to share our strategies for speaking up and pushing back. Though increasing numbers of women of color earn tenure and promotion, assume leadership positions, and enjoy professional fulfillment in the academy, women of color and racial minority scholars still experience marginalization and injustice. We focus on the question: How can women of color in the academy achieve success without being socialized into dominant ideologies of success, individualism, and neoliberalism? Our positionality as women of color in the academy is shaped by global-level problems, leading to a need for solidarity, and the activism that emerges from this need is consequently guided by the notion of sisterhood. Our work together is grounded in an understanding of sisterhood involving shared knowledge, experience, and positionalities around the intersectionality of gender, race, class, ethnicity, nationality, sexuality, and other identities (Collins & Bilge, 2016). We draw on the wisdom of a wide variety of scholars, including Gloria Anzaldua, Patricia Hill Collins, Angela Davis, bell hooks, and the Sangtin Writers Collective. In this colloquium and in all our work, we aim for our work to be accessible and simultaneously theoretical and concrete, and we draw on our personal experiences. In this paper, Ryuko engages with the contradictory forces of marginality and privilege as they play out within her professional and personal life. She examines the ways in which legal and cultural systems both reinforce and mitigate her linguistic, racial, and gender minority status and grapples with her responsibility, as a critical scholar in language studies committed to equity and social justice, to recognize the interplay of marginality and privilege as part of broader sociohistorical power relations. She explores critical reflexivity as a tool for enabling this awareness. Suhanthie discusses her efforts to direct her energies toward lasting institutional change and a critical consciousness of how the practices of the academy shape racially minoritized female academics (Motha & Varghese, 2017). She seeks to move her line of questioning beyond “What do I need to do to advance institutionally?” to “How can I use my presence in the academy to shape it?”, “What kind of a person am I going to become in the process of moving forward?”, and “How can I identify allies who have similar goals for institutional transformation?” As she becomes increasingly aware that many well-intentioned choices allow survival only by unwittingly accommodating or even reproducing inequities within the academy, reinforcing individualist or instrumental ideologies, or compromising personal principles, she seeks to focus more explicitly on her agency in influencing her institutional context and the academy at large. Gertrude speaks from the perspective of a campus administrator seeking to recognize the humanity of each individual and the belief that every person has the capacity to excel and soar when given the space to do so. Her practice is grounded in feminist/womanist and community ways of being and knowing. It is anchored in the ongoing reflexivity of decolonizing mindsets, coupled with resisting and challenging the colonizing mindset of those around her in the academy who might inhibit and limit the capacities of others to realize their full potential because of preconceived notions of power, privilege, race, class, accent, or country of origin. She describes the complexities of “servant leadership style” (Sipe & Frick, 2009). As an African-American woman operating within a system that was designed by White males for the perpetuation of a White male intelligentsia, Rachel uses her position as an “outsider within” (Collins, 1986) to share her analysis of how she has asserted agency and retained the capacity to act purposefully and reflectively within academia. She shares her “treasure trove” of strategies that help her to care for herself, her sisters, and her students. For example, the “24-hour rule” allows time to reflect on the microaggressions of race, gender, class, and privilege. It provides a way to accept that you can’t control what is said or done, but that you do determine how you will react and take action, if necessary. Stephanie believes that allyship is a critical way to work against racism, sexism, classism, xenophobia, and other prejudices and their harmful consequences. Broido (2000) identifies allies as “members of dominant social groups … who are working to end the system of oppression that gives them greater privilege and power based on their social-group membership” (p. 3). We all both need allies and can and should be allies. Being mindful of our own, and others’, areas of privilege and nonprivilege is one of the first steps toward being allies, as well as seeking and finding allies. As an example, Stephanie discusses one important source of allyship and solidarity: faculty labor unions. In the face of daily, relentless attacks; fake news; and assaults on the most vulnerable in society, Shelley turns to theorizations of spirituality in order to create a space for existing peacefully within her academic practice. Her strategies include honoring, unearthing, and revitalizing the wisdom of those who have gone before us, reclaiming the wisdom of those from oppressed and marginalized communities, and recognizing the interconnectedness of our well-being as women and people of color and the well-being of our planet. Angel critiques the survival strategies that have worked for her historically, coining the term “survival habitus” to describe the ways in which the survival strategies she employed when she started out in academia increasingly congealed into an imprisoning way of being that she currently must work to grow out of. She seeks to develop alternative ways of being, acting, and relating to her body and relating to others. She cautions that our past success can be our present failure—failure to take care of ourselves, failure to act and think differently, failure to imagine new ways of serving ourselves and others. We are advocates for sisterhood, solidarity, and change in the academy, and we encourage you who are reading this piece to consider how you can also form groups of like-minded comrades who share identities or commitments, join us in advocating for those in the academy who are marginalized, and work against injustices in our institutions. We welcome questions and comments. Broido, E.M. (2000). The development of social justice allies during college: A phenomenological investigation." Journal of College Student Development, 41(1), 3-18. Collins, P. H. (1986). Learning from the outsider within: The sociological significance of Black feminist thought. Social Problems, 33(6), s14–s32. Collins, P. H., & Bilge, S. (2016). Intersectionality. Cambridge, England: Polity Press. Motha, S., & Varghese, M. (2017). Rewriting dominant narratives of the academy: Women faculty of color and identity management. Race, Ethnicity and Education, 21(4), 503–517. Sipe, J. W., & Frick, D. M. (2009). Seven pillars of servant leadership: Practicing the wisdom of leading by serving. Mahwah, NJ: Paulist Press. The seven Sister Scholars have taught for many years in TESOL and related fields, in Hong Kong, the United States, and Canada. They have held leadership roles at their institutions and in their professional organizations. Both individually and as a group they have published and presented extensively. The Sister Scholars focus on critical approaches and identity issues, especially issues of gender, race, and class in their teaching and their scholarship. Please join us at our open meeting on Wednesday, March 13th from 5:00 pm - 6:30 pm in the Walnut room. We will also livestream the meeting on our facebook page. How do social justice and the arts intersect with language teaching? What arts projects have you done with your students on social issues? Submissions due 15 April, 2019.